The problem arises with the distinction between should be improved and unsalvageable. There are other suggestions with breaking should be improved into 'should be improved by the community' and 'should be improved by the person asking the question' as there are things that the latter can do that the former cannot. Let's assume for a this that the author doesn't know the proper way to ask a question. While this should be improved by the author, lets work form the position that the author can't (language barrier), won't (addicted to 'i' and 'thanks in advance'), or doesn't understand what should be improved (a new user who wants to ask a good question). Note the emphasis on the community. With the Help and Improvement queue this isn't just pushed off into nowhere and left for the author to improve. This reads a bit hard. Furthermore, lots of people reviewing in triage appear to have the perception that this is only for the worst of the worst. 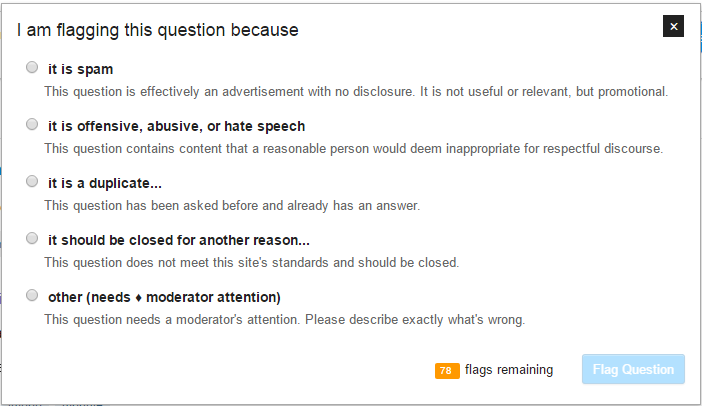 Things that moderators wouldn't argue with a VLQ flag on it. The problem with this interpretation is that questions that should be closed where there is a path for the author to refine the post and have it be a possibly good question (unclear, needs a mcve, too broad) get put into "should be improved" and sent to the H&IQ which leads us to the dissatisfaction with that queue. People aren't sending the 'on topic - no' to unsalvageable. They aren't sending the 'specific problem - no' to unsalvageable. Lets look at focusing this review option on things that the author can do. Unsalvageable for questions where improvement must be done by the author before the community can answer it, or for questions that do not fit in the Stack Overflow Q&A topics. As an aside, it would be interesting to see if there is a relationship between the quality of triage reviews compared to the reputation of the reviewer and their activity in the H&IQ. The measure of quality would be "reviewed post is positively scored and open after a week". "Looks OK" and "Should be improved" would be 'hits' for this criteria. Questions that are either negatively scored, closed, or deleted after a week would be hits for "unsalvageable". Why do I ask this? Because any change in the criteria needs to be communicated to those who are in good faith being too lenient on posts between the should be improved and unsalvageable review options. https://stackoverflow.com/review/triage/7481931 (closed as recommendation) 1.7k said should be improved, 2.6k said should be improved. Communicating the close reasons and quality expectations to these users (you will note that most are sub 3k rep) is key to properly feeding the help and improvement queue. When questions that are all multi line inline code get "looks ok", we haven't done a good enough job at setting the expectations for what a question should look like to those users. Until that is done, in conjunction with improving the wording on the triage review options, the help and improvement queue will continue to be fed with questions where it's mostly "close this" rather than "fix this" (and more than a few 'this should get its markdown fixed before it gets too many down votes' will go through as 'Looks OK'). This isn't a bad idea, but... I'm skeptical that it'll accomplish much. The guidance on the review page itself spends most of its time hidden. The goal is to give new reviewers a broad overview of what they're supposed to be doing there, but once that's done it gets out of the way. Indeed, it might be worth putting some effort into displaying it more often - for instance, after you've failed an audit. Spoiler: it's the one about "this site's standards". My hypothesis is that a lot of folks who would be choosing "Unsalvageable" see that dialog and... Just give up. Clearly, the posts need some improvement; whether or not they meet some unspecified "standards" and should be closed is less apparent. So I looked back through the past couple of days worth of logs. Turns out, folks give up before clicking "it should be closed..." somewhere > 20% of the time when working through Triage. Another 20% give up after getting to the close dialog. One of the humbling lessons I learned from Close Review was that a lot of reviewers don't have the close reasons memorized; they'd compulsively open the dialog just to refresh their memories before making a decision. So I'm less worried about the folks who decide to choose a different option after getting to the close dialog, but the folks whose first impulse is "unsalvageable" and then give up on the first page concern me: we're driving them to make bad decisions by not giving them the information they need. Of course, the actual damage could be much greater. Remember, close flags are intended as training wheels, positioned not just as an input mechanism but as a form of training for new user-moderators. This is the same dialog that everyone under 3K sees - if a sizable portion of flaggers aren't clicking through to the close options (and they aren't...) then that's a whole lot of people who aren't being educated on what options are available. descriptions that cover the breadth of each option in sufficient detail to allow new flaggers to make a sane decision before selecting it. same number of options as today... or fewer. This question is completely unclear, incomplete, overly-broad, primarily opinion-based or is not about [programming] as described in the help center, and it is unlikely to be fixed via editing.